Entrep.ph is in the process of starting-up. We have decided on a name, company type, and initial capitalization. Deciding on a name was a no-brainer. But getting siblings for partners, well, that is another topic that would be up for discussion. 1. Proprietorship – is a business that is owned by a single individual who has full control and authority in running this kind of business. The owner, called proprietor, owns all the assets and is solely responsible for all the liabilities of the company. He or she enjoys all the profits but also suffers all losses of this business. The proprietor and his proprietorship business/businesses is considered as one taxpayer, sharing a single TIN (Taxpayer Identification Number) for tax purposes. A sole proprietorship must apply for a business trade name and be registered with the Department of Trade and Industry. 2. Partnership – is a business that is owned by two or more individuals or partners. Under the Civil Code of the Philippines, a partnership is considered as juridical person, having a separate legal personality from that of its owners (partners). Partnerships may either be general partnerships, where the partners have unlimited liability for the debts and obligation of the partnership, or limited partnerships, where one or more general partners have unlimited liability and the limited partners have liability only up to the amount of their capital contributions. 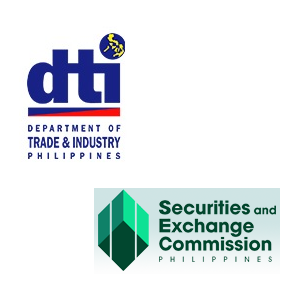 A partnership with more than three thousand pesos (P3,000.00) capital must register with Securities and Exchange Commission (SEC). Partnerships are generally treated like corporations for income tax computation purposes. 3. Corporation – is a business that is owned by its shareholders (natural or juridical persons). A corporation is composed of juridical persons established under the Corporation Code and regulated by the SEC with a personality separate and distinct from that of its stockholders. The liability of the shareholders of a corporation is limited only to the amount of their share capital. It consists of at least five to 15 incorporators, each of whom must hold at least one share and must be registered with the SEC. Minimum paid up capital is P5,000. A corporation in the Philippines can either be stock or non-stock company regardless of nationality. a. Stock Corporation – This is a corporation with capital stock divided into shares and authorized to distribute to the holders of such shares dividends or allotments of the surplus profits on the basis of the shares held. b. Non-stock Corporation. This is a corporation organized principally for public purposes such as foundations, charitable, educational, cultural, or similar purposes and does not issue shares of stock to its members. If you were to say start a business that is a one-person operation, it is best to go solo and choose proprietorship. If on the other hand you are starting a small business with some friends or relatives, you can either go partnership or corporation.